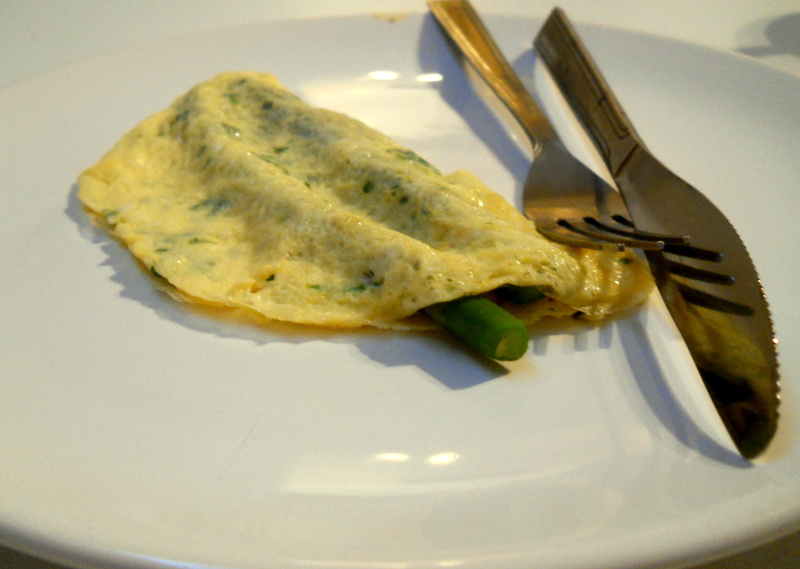 This ‘recipe’ came from the idea of thin egg omelettes used in some Vietnamese recipes. I decided to adapt it and use it as breakfast pancakes or crepes. All you need is: eggs, a splash of milk, a handful of finely chopped parsley, some butter or olive oil to fry and cooked asparagus or your choice of cooked vegetables or meats. Start by whisking the eggs, the milk, and the parsley together. Heat up a frying pan with some olive oil or butter. When the pan is quite hot ladle a small amount of the mixture while rotating the pan (as if you were making crepes) to evenly and thinly spread out the mixture. Cook for a few seconds, add your vegetables and fold over. Serve two or three for a filling breakfast. Unfortunately I have no photo for this dish but it’s really easy to make. For a big round oven dish (enough for 4 people) mix 6 eggs, a big splash of milk or creme fraiche, a tin of tuna in olive oil (drained), some watercress (or rocket), salt and pepper. Put in the oven at 180 degrees for 20 minutes and voila – easy, effortless and healthy breakfast. This is definitely one of my favourites! 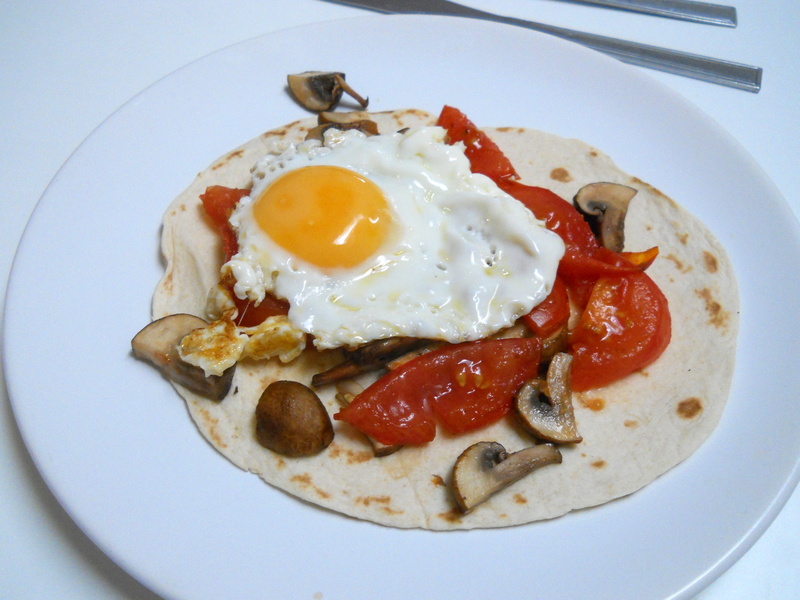 It’s a pretty flexible ‘recipe’, all you need really are tortillas (corn tortillas are the best), eggs and tomato salsa. I usually add whatever I have in the fridge: sharp cheddar, home-made refried beans, mushrooms, tomatoes, asparagus, etc… This is a really filling breakfast and a good way to use up your Mexican leftovers. 1/4 of a Spanish or Portuguese chorizo, chopped in small cubes. 1 large potato, preferably maris piper. Half an onion, sliced finely. Two handfuls of parsley, chopped. This dish takes longer than the other ones and so might be better done in advance – as it can be eaten both hot or cold. Start by peeling and slicing your potato. Drop it in salted boiling water and cook for five minutes. While the potato is cooking fry chorizo in a little bit of olive oil to render the fat. After a few minutes add the onions and cook until soft. Reserve the onion and chorizo and keep the pan hot. Now mix the eggs together and incorporate the rest of the ingredients. In the same pan where you fried the onion and chorizo (on a medium-high heat) drop the mixture and cook, slowly, until the top of the tortilla is almost cooked. At this point you will need to get ready for some flipping skills: put a large plate on top of the frying pan, turn it around (dropping the tortilla in the plate) and return the tortilla to the pan to finish cooking the other side (2 minutes). Serve straight away or keep in the fridge to eat cold. This is obviously very simple. 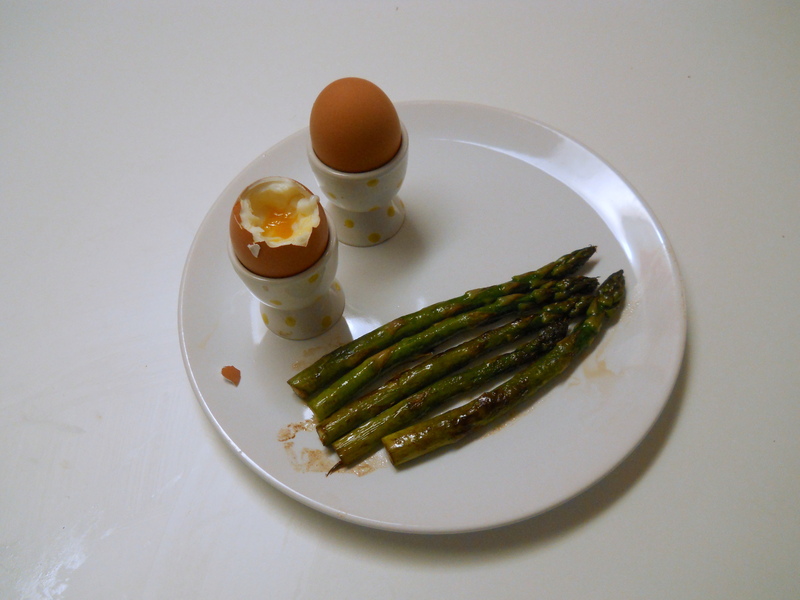 All you need to do is to soft-boil your eggs (this hilarious website can help) and to cook the asparagus. I like to cook them in butter for 5 minutes until they are slightly burnt to get a nutty flavour. Sprinkle with salt and pepper and enjoy. Obviously these are also great cures for Euro 2012-induced hangovers. Today I will be hosting a dinner at my house with, amongst others, Miss Meatball herself as my guest. Therefore, today you are getting both a recipe and a review of the meal. This post should be called: how to make a perfect pizza, then go on to burn your friend’s finger, destroy your oven, cook pizza in a frying pan with a wok on top, and then revive the oven and make really good pizzas again. 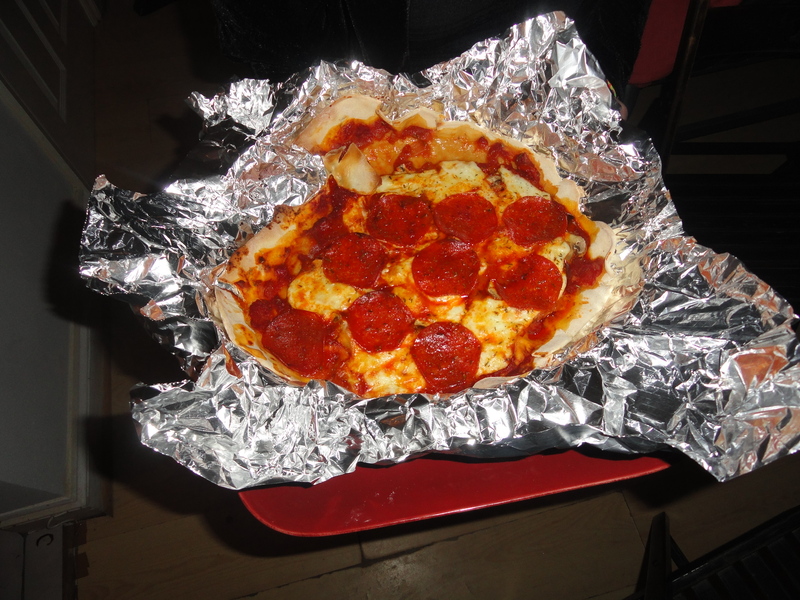 So, skip the burning your friend/destroying the oven bit and make really easy home-made pizza. This pizza dough needs to rise for a few hours, so it’s best made the night before or the day before, you want it to rise as much as you can. I don’t really measure anything for this recipe and just kind of add as I go. You should probably be doing something like 200g of flour and 30cl of water for about two big pizzas, but it’s easier to measure it by looking at it. So you start by putting the flour in a bowl and making a little hole in the middle. Then you start adding the warm water, little by little and mixing in the flour and the water with a wooden spoon. Do this until the dough is mixed and can be kneaded with your hands. Move to a dry surface and knead for 10 mins, adding salt little by little so it mixes well in the dough while you’re kneading. Form the dough into a ball-shape and rub olive oil all over. Put it a bowl which has previously been rubbed with olive oil, cover with a tea towel or any fabric you have in hand and let it rest for a minimum of three hours. While the dough is rising go buy some toppings and start making some tomato sauce. Our first pizza was made of tomato sauce, parma ham, caramelised onions and goats cheese, so I’ll give the recipe for the sauce and the caramelised onions. 1 tin of good quality chopped/whole tomatoes (if you’re a student like me it’s a good idea to buy them in bulk when they’re on a deal at your local supermarket as it really makes a difference to have good quality tinned tomatoes). half a glass of red wine (plus more to drink while you’re making the sauce). garlic, finely chopped (as much as you wish, I usually go for three cloves). good quality tomato paste (they have some really good ones in waitrose, and they last forever). Start by chopping the onions and frying them in a little bit of olive oil, on a medium temperature, for about 10 mins until they become soft. Add the chopped garlic, turn the heat up a bit and fry, while constantly stirring (so the garlic doesn’t burn) for about 3 minutes, just enough for the garlic to release its flavour. Turn the heat up a bit more, add the wine and let the alcohol evaporate. Add the chopped tomatoes, half a glass of water, and a tablespoon of tomato paste. Bring to a boil, turn the heat down to very low, put a cover on and simmer for as long as you can. Season with salt and pepper, and maybe add a bit of sugar if the sauce tastes too acidic. This sauce gets better with time, so ideally you want to cook it for 1h30 hours. You can also double or triple the recipe and freeze it. While the sauce is bubbling on the side you can start making the caramelised onions. some balsamic vinegar or balsamic glaze (this is optional). Start by chopping the onions into strips, it doesn’t need to look perfect. Fry them in olive oil on a high/medium heat for 5 minutes then lower the heat to the slowest setting on your hob and let it cook by itself, stirring from time to time. You can add the balsamic vinegar or balsamic glaze to accelerate the process or you can just let it cook until it looks dark and well caramelised on its own. When all this is done and the dough has doubled in size, you can start kneading again (or you can find someone with strong arms and hands aka. Miss Meatball herself to do it for you). Knead until the dough is smooth and elastic. Then you need to start rolling the dough using a rolling pin (or an old wine bottle if you’re a lazy student like me). Roll it as thin as you can and transfer it to a sheet of tin foil. Your oven should be heated up to its maximum temperature, to simulate the heat of a pizza oven (although, if you have an oven like mine, it might overheat and die after half an hour, leaving you to make pizza on a frying pan and burning your friend’s hand in the process). Now Miss Meatball’s review: This dough and sauce was delicious, so I am only going to comment on it by saying that this will be my dough recipe of choice for making home-made pizza next time. The sauce was dark and rich, and the dough resulted in thin, crispy beauties coming out of the oven (albeit in a asymmetrical sense perhaps). My favourite topping was the first mix, as the smooth goats cheese went so well against the salty crispiness of the parma ham and the sweetness of the caramelised onions. Drizzling a little bit of truffle oil on top of it made it the winner by me. However, the other guests seemed keener on the calzone with chorizo and lots and lots of mozzarella. It being in the shape of a calzone made it gooey and sumptuous and not the slightest dry. All in all, lovely thin pizzas. And making them provided us with plenty of action and entertainment.